Theresa Helene Leff Sabel, (May 9, 1927-November 27, 2018) of Tampa, formerly of Charleston, daughter of Dave Leff and Blanche Berendt Leff, widow of Herman Sabel. Theresa was a native of Hartsville, SC. Theresa graduated from Memminger High School, and first met the love of her life Herman "Hymie" Sabel, on Erev Yom Kippur outside Brith Sholom Beth Israel Synagogue. She noticed him in his Navy Uniform in the early days of his enlistment before he participated in the D- Day Normandy Invasion. Theresa attended Coker College, and graduated from the University of Georgia and later from Rice Business College. After marrying Hymie in 1949, Theresa began her service to BSBI and Charleston’s Jewish Community. She was a member of many organizations, but she was proudest of her tenure as President of the Sisterhood, d u r i n g w h i c h t i m e t h e management at the Francis Marion Hotel was persuaded to install a kosher kitchen, and of her service to Hadassah as Fund- Raising Vice President. She was pleased and proud that all pledges made, were in fact, collected. 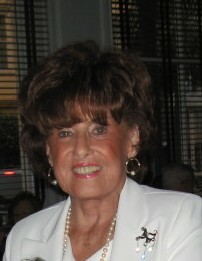 She is a Life Member of Hadassah and of the Sisterhood at BSBI. Theresa is survived by her four children: Sharon, (Patrick) of Pompano Beach, Diane, David and Harvey, all of Tampa; her favorite son-in-law, Patrick; grandsons: Mark and Brent McElmeel of Pompano Beach. She has been a true example of a Woman of Valor to those who remain to cherish her memory. The family extends their love and thanks to Valencia Vickers of Family Home Health, and Connie Futrell, private caregiver, for their loving and attentive care. Special thanks and love to Terri Moya Goodwin who was ‘another’ daughter to our mother. Graveside Services will be held on Friday, November 30, 2018, in Brith Sholom Beth Israel Cemetery (Maryville) at 1:00 p.m. In lieu of flowers, memorial contributions may be made to Hadassah.